Over at Theme Thursday this week they've proposed member bloggers write about hats. Let's see. What do I know about hats? In the early 60s Del Shannon sang "Hats Off To Larry". In the 70s Randy Newman rewrote the musical canon of love with "You Can Leave Your Hat On" later made popular by Joe Cocker. Would be politicians "throw their hat into the ring" when they decide to run for office. Once there, voters discover they're often "talking through their hat". Some people go to an event called Ascot, but don't wear an ascot at all. They wear a hat. When something unforeseen is about to happen one says "hold onto your hat", even though you may not be wearing one. And when one is successful at something, another gives them a "tip of the hat" again, even though they may not be wearing one. When you are wearing one you should remove it when you sit down to eat. In the Wild West good guys wore white hats. Bad guys wore black hats. In old movies, I recall Fred Astaire wearing a "top hat" and tails. I think he may have also worn a "straw hat" which was once quite fashionable. Today "baseball hats" are all the rage, worn mostly by sports and NASCAR fans, skateboarders and golfers. And when you are about to ask someone for a favour you may approach them "hat in hand". And that's my dissertation on hats, off the top of my head mind you. Check out Theme Thursday and discover how other bloggers have treated this theme. Oh, and remove your hat when you get there! I've never worn hats or caps. I always thought my dad and his generation looked sharp in a coat, tie and hat though. I'm afraid I would end up wearing it backwards or something stupid like that. Wearing it with the price tag still on it...oh, how damned stupid! hats off to you for a wonderful tour of hats...first one today to mention hats in the ring...happy tt! Don: Up here, when the temp dips, we wear toques! When I go fishin', and I'm sitting out in a boat on the water all day I'll wear a baseball cap...sometimes backwards. Brian: Oh, there's a lot more expressions, I'm sure. Hey, I think that lady is smiling at me! Does she know me? And what a dorkus guy, shading his eyes! Sometimes I wish I had a huge hat with peacock feathers. Just sometimes. HA! Quirks: Yeah, she's got a spare body organ for you, Dr. Quirky, Medicine Woman! You're a many who wears many hats. Thank you for putting on your thinking cap and writing this post. It's nice to see someone using their head for something other than a hat rack. Okay. tHATS all I have to say about hats. So good, Dufas! You are indeed a clever fellow... and I will curse you for the rest of the day if I can't get "Hats Off To Larry" out of my head. I tip my hat to you! 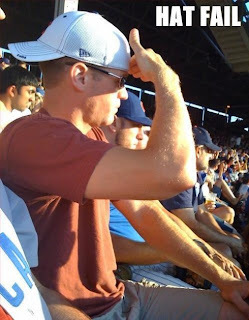 Love the guy shielding his eyes instead of using the brim of his baseball cap do its intended job. Leeuna: Ok, ok, I've hat enough! Now that Larry said goodbye to you. Kelly: I jast had to share that pic! 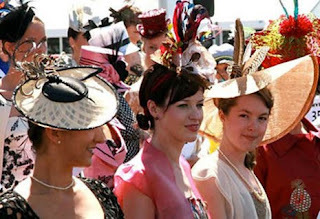 I'd like to attend royal Ascot just to look at the hats. I know they do something else there...chase horses around or something, but all I care about is the hats. Christine H: It's quite the occasion. With some wild hats. And a horse or two. lol @ hat fail. That was awesome . Jackie: I think he's looking to get a tan. I take my hat off to you on this fine dissertation! Hey No Name...Excellent post...here is the one I did about that last Dufas..
and notice, he is Cubs fan!! Seldom commenter but long time follower...Keep up the excellent offerings. i think that just about covers it! great job! happy tt! CL: And I did it without a cat in the hat! longrooffan: Thanks for following along. Glad you're here for the ride. CMJackson: Covers or "caps" it, yep, I think so. Dreamhaven: Glad you enjoyed the post. But it's nowhere near as creative as those hats of yours! Rather interesting site you've got here. Thanks for it. I like such topics and anything connected to them. I would like to read a bit more soon. Hilary: Thanks a bunch. Hope you come back soon. It was rather interesting for me to read the article. Thank you for it. I like such themes and everything that is connected to this matter. I definitely want to read a bit more soon. Bella: You're quite welcome. Hey! Are you related to Hilary?